A few days ago, a Walgreens cashier informed me that they already have their Valentine's Day merchandise stocked up in the back. Wait, what? Wasn't I just grilling veggie dogs for Memorial Day in my flip flops and swim trunks?There is no denying that the holidays are literally just around the corner which means you need storage, and you need storage FAST. Make sure to call the store at 323-644-5590 to see if an item is still available. This historical 1940s riveted steamer trunk was handmade of balsa wood and wrapped in aluminum. On the top of the trunk, there is an old LA address written in permanent marker complete with a 2 digit zip code. 5 digit zip codes didn't go into effect until July 1, 1963. This 1960s hacienda trunk was hand crafted in Tonala Mexico in 1965. The trunk still has its original forged hardware. 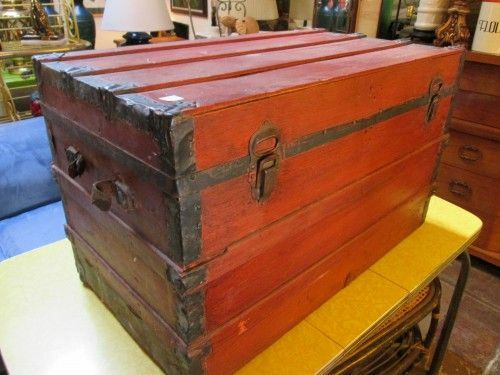 This awesome handcrafted red trunk still has its original metal trim. Use this bad boy as a coffee table and stuff your extra linens or records inside. 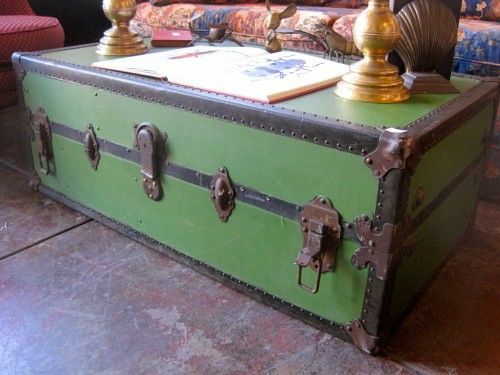 This awesome vintage green trunk would make an excellent coffee table and storage unit. Store linens/records/board games in the trunk to maximize your living space.